Who Was Responsible For The War In Europe? 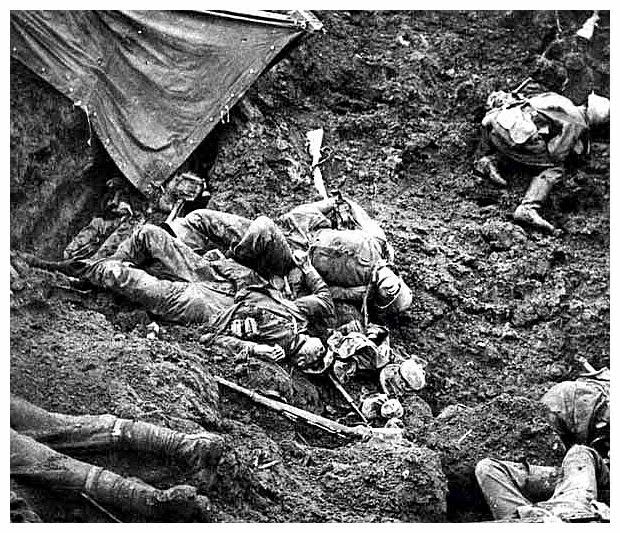 The photograph shows the impact of World War 1 on Britain and France. Their military was affected as many of their soldiers died. World War 1 had a huge impact on Britain and France. They suffered a large amount of losses, economically and militarily. Thus, Britain and France needed to rearm and follow the appeasement policy. Hence, they had a lack of action towards Hitler's acts of aggression and led to World War 2. Therefore, the European Democracies are responsible for the War in Europe. The source is a letter from German Foreign Minister Konstantin Freiherr von Neurath to the League of Nations, regarding their withdrawal from the League. Germany withdrew from the League of Nations in October 1933. This was because the League had refused to allow Germany to rearm. After leaving the League, Germany carried his plan to rearm and build up their defence. This led to the attack on Poland on September 1, 1939, and the outbreak of World War II. Hence, Hitler is responsible for the European War. The League of Nations had many weaknesses. 1) No army to enforce - limited power to punish countries that did not go along with its findings. 2) The Council did not meet often - decisions not unanimous, hence could not react quickly to conflicts. 3) Important countries of power and influence did not join. Germany: had to demonstrate that they were a peace-loving country before they could join. Soviet Union: regarded with suspicion, only joined in 1934. USA: Isolationism - felt that joining to League would involve them in more European Wars. They wanted to avoid that. This shows that the League of Nations, that aimed to resolve international disputes, maintain world peace ans security, and prevent another war from occurring, had too many weaknesses, that affected their credibility and authority. Hence, the European Democracies are responsible for the European Wars. 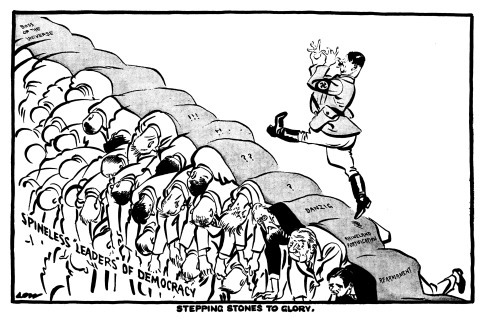 The source shows Hitler stepping over leaders of the League of Nations. One of the leader that he already stepped over is labelled armament. This shows that Hitler climbed over the League of Nations, and succeeded with building up Germany's military. He violated the Treaty of Versailles done by the League of Nations, expanded the army and possessed an air force by March 1935. Hence, Germany had a formidable and dangerous military power that allowed him to put his expansionist plans into action and conquered other land and the outbreak of the European Wars. Therefore, Hitler is responsible for the War in Europe. Extract from a letter from Nevile Henderson, British Ambassador in Germany, September 6th, 1938 (FO 371/21737) "I suppose the chances of Hitler coming out at Nuremberg with what will amount to peace or what will amount to war (thunder there is sure to be) are about 50-50. I opt for the former." Chamberlain had believed that Hitler was someone that who could be reasoned with. However, he was wrong. He had thought that Hitler was revising the Treaty of Versailles, but in actual fact, Hitler was trying to abolish it. Chamberlain is also for signing the Munich Agreement that allow Hitler to have Sudetenland of Czechoslovakia. Chamberlain believed that Hitler would stop making demands after gaining control over Sudetenland. He was wrong again. Hence, this shows that the incorrect judgement of Neville Chamberlain caused the European Democracies to be responsible for the European Wars. The source shows a newspaper showing the news of Austria was annexed by Germany on 13 March 1938. Hitler wanted to make Austria to join Germany. After the annexation, Austria's resources of gold and iron ore, and the army and weapons were at Hitler's disposal. With this, Hitler expansionist policies allowed him to have more power and hence is responsible for the European War.